Thanhouser Company; Princess Films; Promotional materials; Silent films; Ostriche, Muriel; Marshall, Boyd; Percy, W.S. 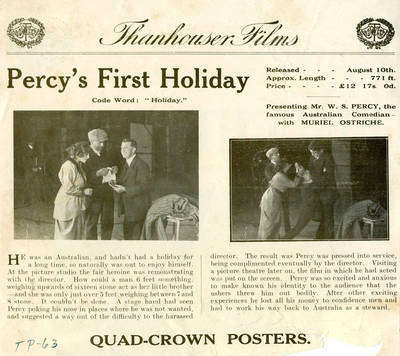 Advertisement for the British release of "Percy's First Holiday," August 10, 1914 [U.S. release February 8, 1914]. This Thanhouser silent film featured a famous Australian comedian, W. S. Percy, when he visited the United States in 1913. Muriel Ostriche and Boyd Marshall also appeared in the production and Caril Louis Gregory directed and was the cameraman. Lloyd Lonergan wrote the scenario. Offset prints; 6.75" x 7.5"